An update: A cyclone warning class III is currently in force in Mauritius. 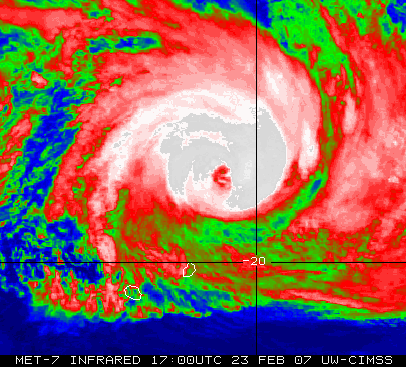 In other words, at this very moment (22:23 MUT), Mauritius is under full cyclonic conditions. Gamede is dangerously approaching our island. Many students have contacted me to know if they should come to the University today but, as confirmed by the Head of Department Dr Oveeyen Moonian by phone, all classes are cancelled because of the cyclone warning class II. Notice that I had to call the HoD by phone to get this information as I could not (even after 30 minutes of intense search) find anything pertaining to cyclones and the university rules on the UoM website, the Ministry of Education website or the Mauritius Meteorological Services website. In my opinion, this is not acceptable. btw lecturers have to pe present?? Academic and non-academic staff have to work until class III. indeed there is a lack of information..
in my first year we had a similar situation and were all confused..
had to come to uni to finally find out that was no lectures..
letemps cyclone ine fer pou paC en famille.. It is now 22:12 and it’s only now that electricity has been restored after it was cut around 16:30. So the kids, Christina and I spent around 6 hours without lights, the TV, computers and our essential Internet connection… but it was cool. We spoke a lot. Laughed a lot. And now the kids are fast asleep. n a chance that nomad is working in a class III!!! have a great time.i hope that 2morrow there is no school.